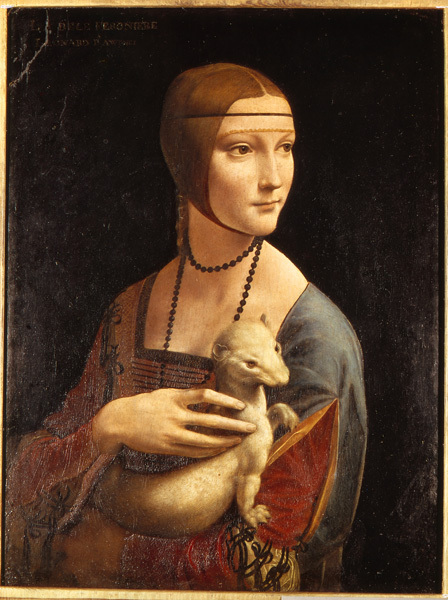 Like the painting by Ambrogio de Predis of Bianca Maria Sforza, Leonardo da Vinci’s Portrait of a Lady with an Ermine was made at the court of Milan, where Leonardo was in residence between 1482 and 1499. It almost certainly depicts Cecilia Gallerani, who was then mistress of duke Ludovico Sforza (discussed earlier). Here, the formal conventions of Bianca’s state portrait—especially the profile pose—are relaxed. Instead, Leonardo turned Cecilia three-quarters to open her body to the viewer. She seems to have paused, stopping for a moment to direct her attention outside the picture frame. Almost certainly it is Ludovico who is meant to be the object of her lively gaze. Renaissance poets and courtiers were unanimous in believing that a person first fell in love through the eyes, which they called the “guides of love.” For them, eyes revealed passion more effectively than did speech. With long fingers, Cecilia cradles an ermine against her body, an unusually active gesture in a portrait of a woman. Painted somewhat larger than life, the ermine was one of Ludovico’s emblems, but ermine—galee in Greek—is also a play on Cecilia’s surname (and one of the clues by which she was identified as the subject of this portrait). Few other animals appear with such prominence in Renaissance art. Its symbolic intent is clear: the ermine stands in for the duke, who receives his lover’s embrace by proxy. This innovative portrait achieved a certain measure of fame in its own time. 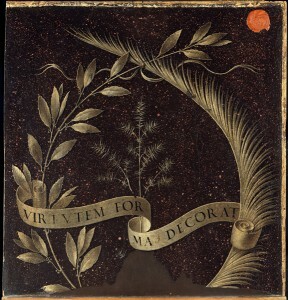 Isabella d’Este, sister of the duke’s wife, Beatrice, wrote to Cecilia requesting to borrow it. Isabella was in the market for a new portraitist (one she hoped could conceal her girth). (Read Cecilia’s reply to Isabella in “Lorenzo de’ Medici on love and beauty.”) Their exchange reveals the extent to which Cecilia was accepted openly as a member of court (although of lower status than either Beatrice or Bianca). Her direct dealing with her lover’s sister-in-law also indicates the tolerance shown toward the affairs of powerful men. As was often the case among royal mistresses, Cecilia was eventually married off to a minor nobleman. The dates of their affair are not entirely clear, but Sigismondo may have met Isotta in 1445, when she was probably twelve years old and he was twenty-six. He was already married to his second wife, and with a mistress as well. Isotta, daughter of a wealthy wool merchant and counselor to Sigismondo, likely became his lover the next year. Her age (sixteen at most) must be considered in the context of Renaissance norms, when girls of fourteen or younger were commonly wed. Sigismondo’s legacy has been colored by a reputation for brutality and violence that began in his own day, when a pope who was aggressively allied against him described him as a monster (see “Condemnation of Sigismondo Malatesta”). But Sigismondo was also a patron of the arts and letters—and he seems to have been devoted to Isotta (although his feelings did not prevent his taking other mistresses as years went by). She, not his wife, quickly became the focus of court life in Rimini; she also came to enjoy a considerable literary reputation. A number of poets, who became known as the Isottei, wrote poems about her. When—in 1454 or possibly 1456, some years after his wife’s death in 1449—Isotta and Sigismondo married, the groom might well have benefited from another, more strategic match. The willingness and affection of the women who became mistresses of powerful men are difficult to gauge, but it is possible that Isotta was similarly committed. At least that is the impression conveyed by the Liber Isottaeus, a three-volume work in Latin that Sigismondo commissioned from the humanist Basinio da Parma in her honor. 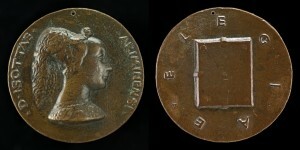 The book, with the word “elegies” around it, appears on the reverse of the second of Matteo’s medals bearing her image. The story treats their romance as one of courtly love (see “A poem from Sigismondo Pandolfo Malatesta to Isotta degli Atti”). At one point in the epistolary narrative, Isotta’s father questions her about the wisdom of surrendering her chastity. Her response is essentially, “What can one do in the face of such love?” In real life, Isotta seems to have been clear-eyed and practical, receiving substantial amounts in goods and gems before securing her position with marriage. Her brother was knighted. Isotta was not strong enough, however, to rule in her own right after Sigismondo died in 1468, and their son seems to have been incapable. Another of Sigismondo’s illegitimate children took control in 1470, but Isotta continued to live in Rimini, in her own house. Sigismondo had the elephant medal cast around the time he married Isotta, but the date on it, 1446, is at least ten years earlier than the actual date. 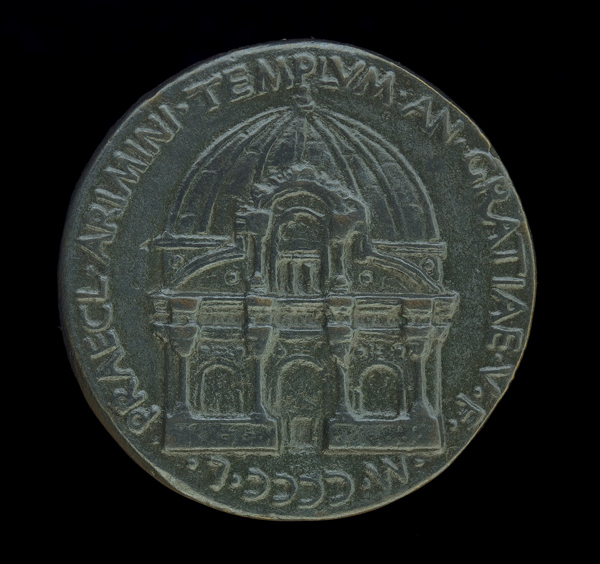 The same date appears on several other medals and on the elaborate tomb he had constructed for her in the Tempio Malatestiano. 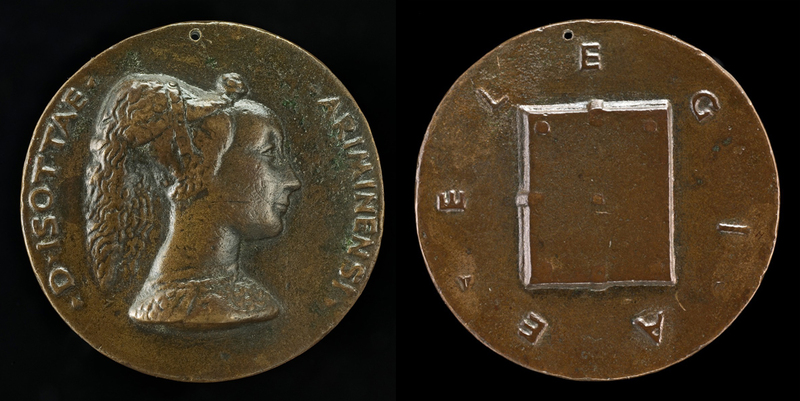 It is tempting to see 1446 as commemorating the start of their affair (although it has also been argued that it marks the completion of Castel Sismondo, which appears on the reverse of another of Sigismondo’s medals). The medals, like the tomb, were meant to serve Isotta’s eternal memory, a meaning signified by the elephant. Copies of the medals were set into the walls and foundations of various buildings that Sigismondo constructed, to be discovered by later generations. Some came to light only after the bombing around Rimini during World War II. 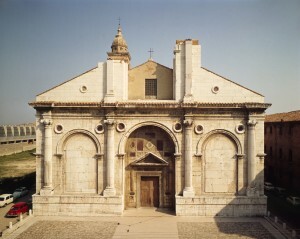 Isotta’s tomb was the raison d’être for Sigisimondo’s restoration of the church of S. Francesco, called the Tempio Malatestiano. Leon Battista Alberti designed the façade, while Matteo, sculptor of the medals discussed nearby, made much of the interior decoration. 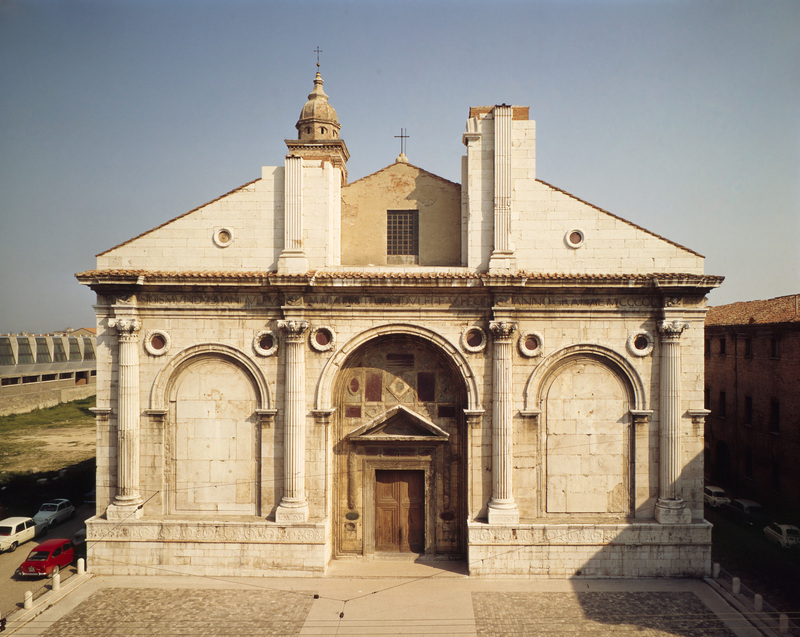 The building is a landmark in Renaissance architecture and marks the first time a Roman arch was used on a church. The reverse of another of Sigismondo’s medals shows the plan for the building, including a dome that was never built. 3. Portrait of a daughter? Wife? Platonic lover? Most women’s portraits were painted on one of two occasions: betrothal or marriage. Some were destined for the new husband and household, while others (probably fewer) were kept by parents as a remembrance of a departing daughter. In paired wedding portraits, the woman is almost invariably shown facing left toward the man. Leonardo’s portrait of Ginevra de’ Benci, who looks right, was no doubt intended to stand alone. The question of who commissioned it and why may have several different answers and continues to excite scholarly debate. It is a puzzle that opens onto various aspects of the lives of men and women in fifteenth-century Florence. 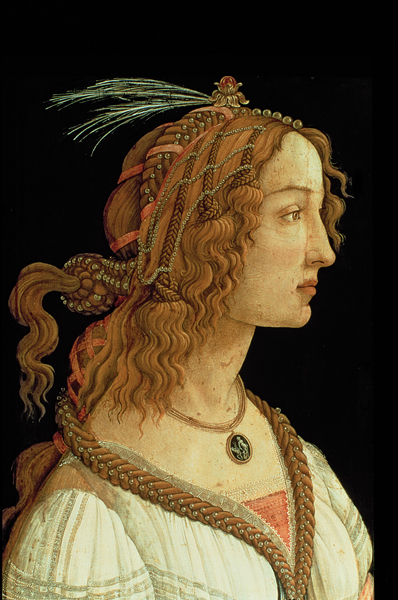 A daughter in a wealthy banking family, Ginevra was married in 1474, at age sixteen, to a widower named Luigi Niccolini. Her portrait must have been painted around that time because its style is that of a young Leonardo, just beginning to work out the innovations that would transform painting in the Renaissance. It differs, however, from other contemporary wedding portraits in several respects. Ginevra wears a simple brown dress, not the elaborate brocades of most brides, and she has no jewelry. Even more unusual, she turns in three-quarter pose, offering the viewer greater insight into her personality. If she remains enigmatic, even indecipherable, we still have a chance to consider what the artist himself called the “motions of the mind.” Ginevra’s is possibly the first Italian portrait of a woman to abandon the profile pose (although three-quarter views were already fairly common in male portraits in Italy and in female portraits in northern Europe). 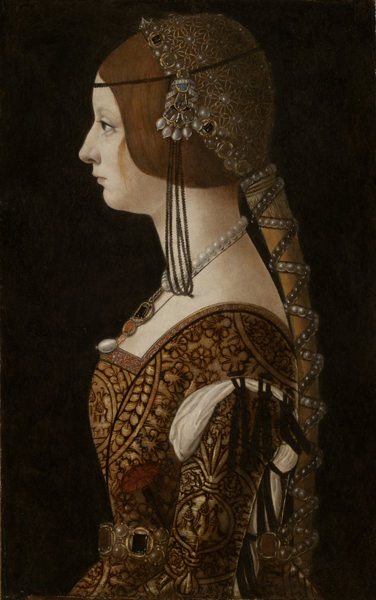 It predates Leonardo’s portrait of Cecilia Gallerani by about fifteen years. The motto we see on the ribbon today, which extols the primary virtues desired of all Renaissance women, was painted over the one that had originally appeared there. It read VIRTU ET HONOR (Virtue and Honor). Venetian humanist Bernardo Bembo used the earlier motto and the laurel and palm wreath as a personal emblem—and these facts link this portrait to a platonic love affair between Ginevra and Bembo. Their devotion was well documented at the time; poets in the circle of Lorenzo de’ Medici wrote several poems in celebration of their love, as did Lorenzo himself (see “Poems about Ginevra and Bembo”). Bembo was in Florence twice as ambassador, between 1475 and 1476 and from 1478 to 1480. It was probably during his first stay, when he was forty-four, that he took Ginevra as his platonic lover. In doing so he was following Florentine fashion—Bembo and Ginevra may well have met at the joust sponsored by Giuliano de’ Medici in honor of his own platonic love, Simonetta. Through his devotion to a young Florentine woman renowned for her beauty, virtue, and intelligence, Bembo may have been seeking to reinforce his Florentine connections. Their affair arose during a period of some stress between Florence and Venice. Was this portrait the product of that platonic affair? The panel has been cut down—perhaps Ginevra’s hands and whatever she held, if anything, would have been clues. It has been suggested that Bembo commissioned both Ginevra’s portrait and the emblematic reverse. If so, the commission had to have been made soon after his first arrival in Florence, since a later date cannot be reconciled with Leonardo’s early style. 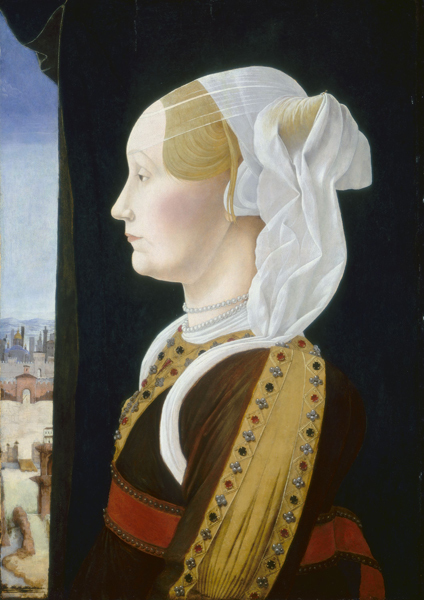 It is perhaps more likely that Ginevra’s family ordered her portrait from the young painter. 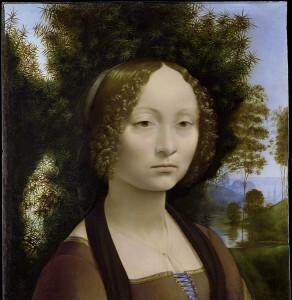 We know that Ginevra’s brother and Leonardo became lifelong friends; perhaps their friendship prompted the family to give the commission to Leonardo or perhaps it grew during the course of the painting’s execution. The Benci might have wanted this unusually serious-looking image of their brilliant poet-daughter—their “mountain tiger”—before her life was dominated by new roles as wife and mother (although Ginevra would remain childless). The family is more likely than Ginevra’s husband to have commissioned the portrait, given that so few conventional wedding elements appear in it. Bembo might have added his motto and emblem to the reverse of the already existing portrait a bit later. But would the family have surrendered it to him? And would he not have wanted to take the picture of his ideal lover with him when he returned to Venice? The painting seems to have remained in Florence. Why was the motto repainted? A suggestion has been made recently that the portrait has little to do with a platonic affair and more with Ginevra as an independent-minded individual who eventually removed herself to a religious life among other strong-willed women. In this scenario, it is supposed that Ginevra worked with Leonardo to fashion the startling new way she was depicted. It is argued, too, that she first developed the emblem on the reverse, which Bembo only later adopted as his own, and which she subsequently reclaimed by modifying, and feminizing, the motto. At present the details remain impossible to know.